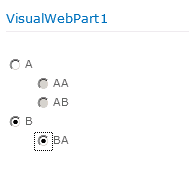 In this blog post we’ll discuss how to use jQuery in a visual web part to help implementing parent/child radio buttons. To accomplish this, we’ve borrowed ideas from other places, we’ll mention them as we go along. 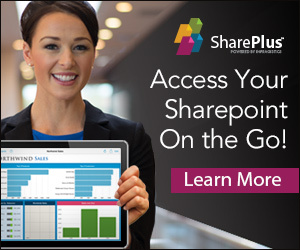 First, create a new SharePoint project and add a visual web part to it. Then, download the latest version of the jQuery library. We’ll be using jquery-1.7.js. Please note: This is the developer version, which we’ll be using throughout this example. In a production environment, you should use the minified version instead (called jquery-1.7.min.js, or the equivalent of the version you are using). Open a site collection SharePoint Designer 2010 (SPD). Click the Site Assets node. Open Windows explorer and browse to jquery-1.7.js. Drag and drop it within the Site Assets node. Please note: You shouldn’t use the ondemand=true attribute, as we want the jQuery library to be available right away. Press F5 to open MSIE (we’re assuming you’ll be able to add the visual web part to the web part page). Press F12 to bring up “Developer Tools” (for MSIE 8 and higher). Click the Run Script button. If the page background turns cyan, you’ll know that it works and that jQuery did it for you. 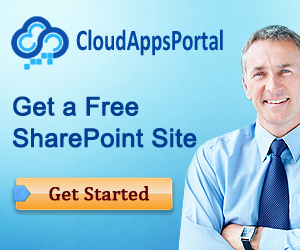 Right-click SharePoint project and choose Add > New Item. Choose Module and call it MyAssets. Within the MyAssets folder, delete Sample.txt. Right-click the MyAssets folder and choose Add. Locate jquery-1.7.js (or better yet: locate the minified version) and add jquery-1.7.js. Open up Elements.xml, and add the following attribute: Url=”SiteAssets” to the Module element.